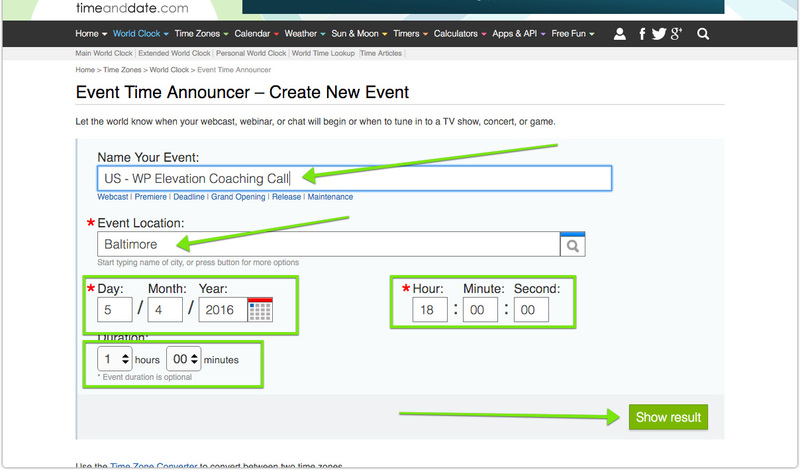 This is the process for adding coaching calls and webinars to the calendar in Asana. 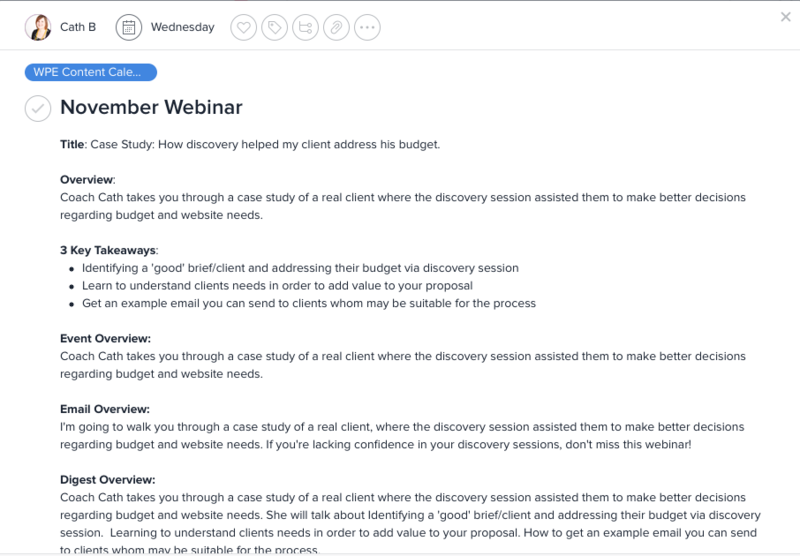 We use the Content Calendar project in Asana to plan our training webinars and coaching calls for our members. The more value we add to our members through these calls, the more likely they are to benefit, stay in the program and refer their friends. This calendar helps us manage all the moving parts for each of the calls, and as you will see, there are a few moving parts indeed. Login to Asana and navigate to the Digital Production project. We use template task for both coaching calls and webinars. Start by copying the task (do not edit the template task). A Copy Task box will appear. Leave the includes as they currently are and click Create New Task. After about a minute a duplicate task will have been created. You can now start entering the details of the event into the task. Replace the task title (Copy of Webinar / Coaching Call Template) with type of task it is. For example, it could be Webinar or Coaching Call. Assign the task to the person who is running the event. Assign the date of the event. This should be in Melbourne time. Do not add the specific hour, as you will add this in another area. Overview: the overview of the event as written by the coach. In the case of a general Coaching Call run by Troy (ie, not a Blueprint call), you can add the text: "Come prepared with any of your pressing business questions and problems. Let's dissect them together and get you elevating!" In the case of a Blueprint call, use text from previous Blueprint call tasks so you don't have to make it up each time. 3 Key Takeaway / Discussion Points: This is for the coach to be clear what the purpose of the event will be. This will also be added to the website, when the replay is posted. Event Overview: 1 line description which will appear on the events calendar. For a Coach's call, it should be written as "Coach Mike talks about ...."
Email Overview: (229 character​ limit) This is the description that will appear in the emails. Must be written in the first person. No more that 2 lines as there is a character limit in Infusionsoft. For a general Coaching Call of Troy's (ie. not a Blueprint call) you can add the text: "Come prepared with any of your pressing business questions and problems. Let's dissect them together and get you elevating!" 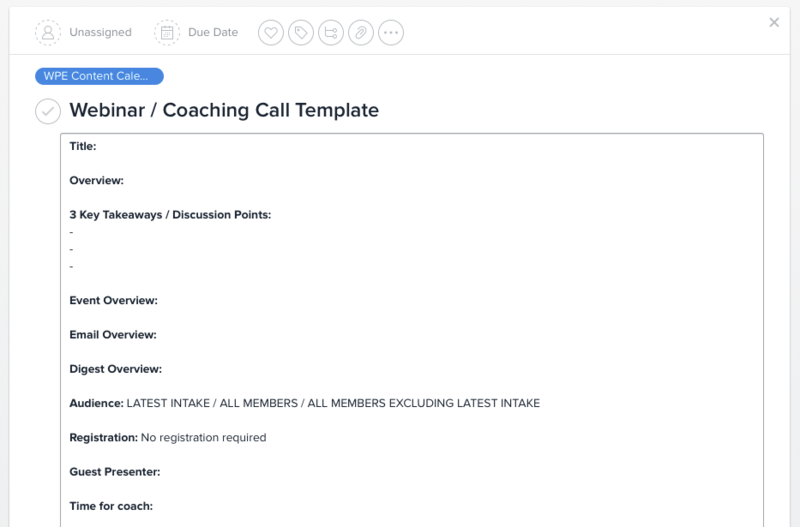 For a Blueprint Coaching Call search the text from previous Asana Coaching Call tasks and add that to save you having to think of new text for each call. Digest Overview: This is what will appear in the digest and will be used to promote the event. Must be written as "Coach Mike will talk about ..." Please note that there are 2 options here - the "Just Launched" which is text to add to the digest if the call has been released that week OR the "Coming Soon" text to add for if this content is being released the following week after the email goes out. Audience: There are 3 options to choose from. Delete the two which are not relevant. This will have been pre-determined when the event was first discussed with the coaches​. Registration: The default for this is no registration required. Change only if necessary. Time for coach: This is the time for the coach. For example: 8am 2nd Nov AEDT (if it's Troy or Cath in Aust). Everything below can be left blank for now because you don't have the information yet to fill in the fields. This is what the event should look like at this stge. 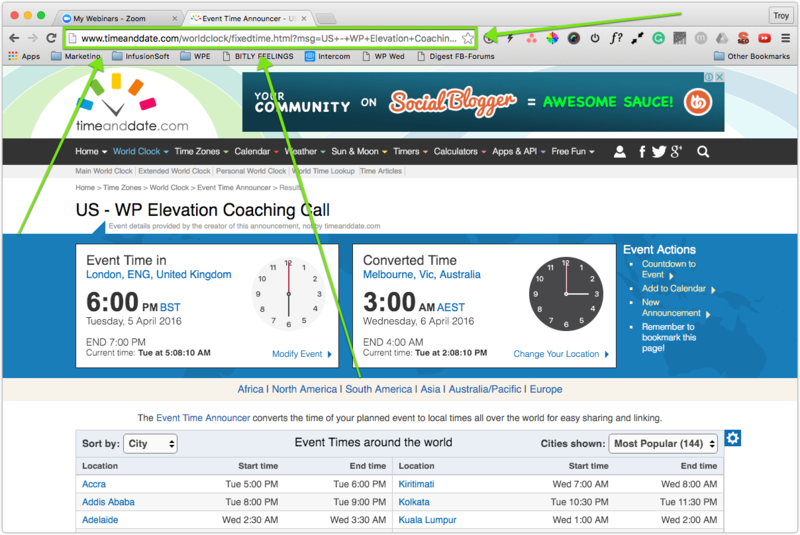 We create a timezone link so that members can easily see the event in their own timezone. We will add this link to the emails and the events page. You will need to refer to the asana task you have just created for the relevant information. The date that has been agreed with the coach, in their timezone. The time that has been agreed with the coach. 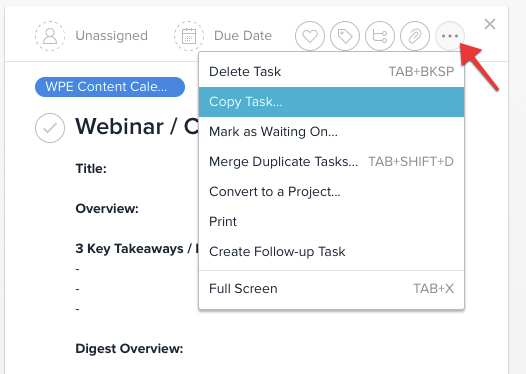 The asana event template will contain 4 subtasks. The event needs an image to represent this. We need that image in a number of different formats. This task should be immediately assigned to Pat. This task will set up the event in zoom, and then in Infusionsoft. The task time should be 7 days before the event. Once the event has finished, it needs to uploaded to the website. The task time should be set to the same time as the event. After the call has gone live, it needs to be promoted to the members. The task time should be set to the same time as the event. You will know you are done when you have created a task in Asana with a date, assigned it to the relevant coach and filled in the description with the relevant items. You will also have assigned the subtasks to the relevant members with due dates.